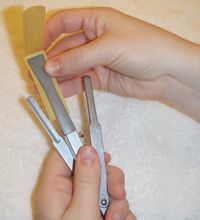 Shaping takes a rectangle of cane and turns it into a mirror image reed shape. There are two types of shapers on the market, a fold-over shaper and a straight shaper. If using a folder-over shaper the cane must be gouged and profiled before shaping. If using a straight shaper, cane must be gouged but you have the option of shaping before or after profiling. There are numerous types of shapes used by bassoon players and many different makes. I own a Rieger fold-over shaper. I chose the Rieger fold-over because I found that I had better consistency of shape with a fold-over shaper (when comparing the two sides of a single reed) and liked the interchangeability of shaper tips with the fold-over model. I’m currently using a #1 tip. Shaping requires you to cut along the cane with an extremely sharp knife. I use an exacto style knife with snap-off razor blades that has a blade lock so it cannot move. This is deal because when running a knife along a metal object it dulls quickly, so I like being able to snap off the blade and have another extremely sharp one without wasting the time to sharpen it. Also, razor blades are much sharper than any knife. Cane must be soaked before shaping; I soak for at least 2 hours before shaping. I often shape right after profiling. First measure and fold the cane over on the center-line. It is important to support the center of the cane with a solid thin object; I use a ruler. Once the cane has started to fold removed the ruler and finish folding. Support the cane when folding with good finger support. Have your thumb directly under the center-line on the ruler holding it in place and have your other fingers press right at the line evenly. Center the cane on the shaper. The tickets part of the profile should be in the middle of the profiler. The grain of the cane should be perpendicular with the tip of the profile. Once both sides are aligned lock the handle so the cane is secure. The MOST important part of shaping is keeping your knife directly perpendicular to the shaper side! Do not angle the knife in anyway or your shape will be distorted. Take small amounts of cane off at a time. 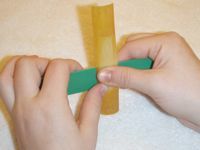 Cane has natural grains and will want to tear along those grains; the shape of a bassoon reed is not necessarily in line with the grains of the cane so you need to go slow enough and have a sharp enough knife to make sure you are not ripping along the grain but rather following the shape. Make sure to keep the knife level when getting close to shape. The back of most shapes flare out slightly. I find that it is hard to get the grain to stop its natural course and flare out with the shape, so I cut up about ¼ inch from the back forward so that when I then cut back down I will meet at my upward cut and have the proper bottom of the shape. When you have removed all excess cane from the sides and the sides of the cane is flush with the shaper you are done.